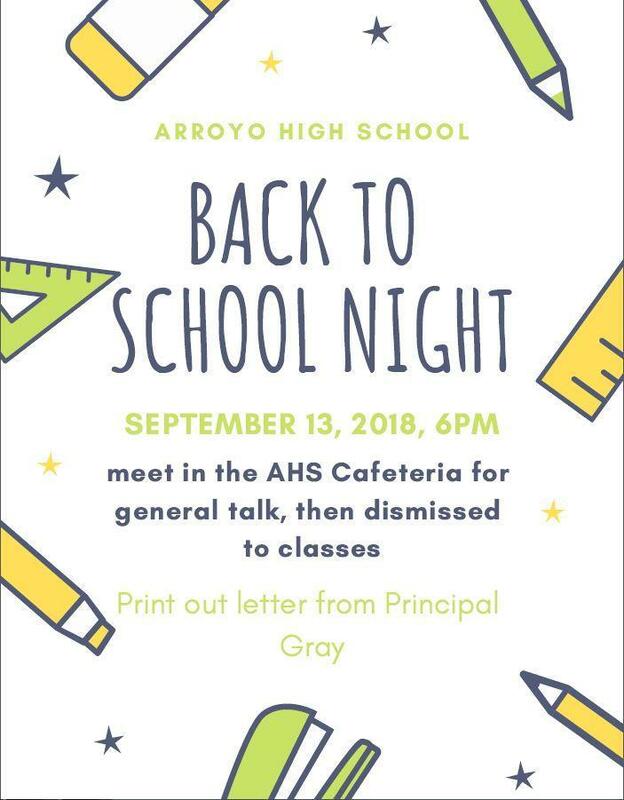 Hello School Community of Arroyo High, this is Principal Gray asking you to save the day and date of Thursday, September 13, 2018 for our annual Back to School Night. Our event will begin with introductions at 6:00 for our families in the Cafeteria moving to class rooms visits at 6:15. Please join us early as parking will become more challenging later in the evening. Keep a copy of your student's schedule to help navigate the campus smoothly. Our program and schedule will be posted on our web page. We look forward to meeting with you, thank you. The general session in the cafeteria will be a brief introduction to our administration and provide you with general information about the school.